Gua Sha - Sister therapy to cupping in TCM (traditional Chinese medicine) - Helps relieve local stagnation, physical discomfort and increases blood flow to effected areas for quicker immune response in the body. 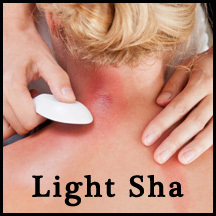 Gua Sha releases fluids that contain metabolic waste and congest the surface tissues and muscles. Gua Sha promotes circulation and normalizes metabolic processes. It is a valuable treatment for both external and internal pain, and facilitates the resolution of both acute and chronic disorders. 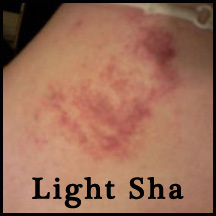 Gua Sha (pronounced 'Gwah Sah') is a technique that involves palpation and cutaneous stimulation where the skin is pressured or scraped in strokes with a round-edged instrument; that results in the appearance of small red petechiae called 'sha', that will fade in 2 to 3 days. Raising Sha is said to promote normal circulation and metabolic processes.